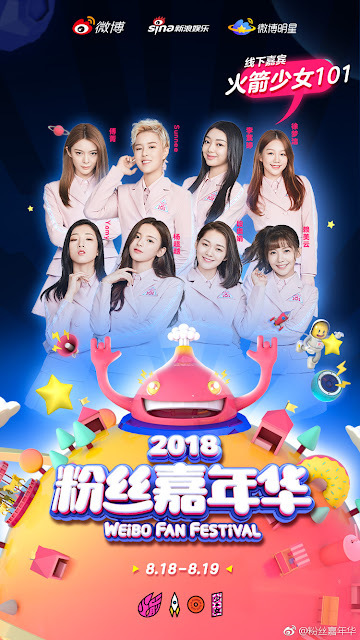 On August 9, Yuehua Entertainment and Mavericks Entertainment suddenly announced Meng Meiqi, Wu Xuanyi and Winnie Zhang Zining's departure from Rocket Girls. 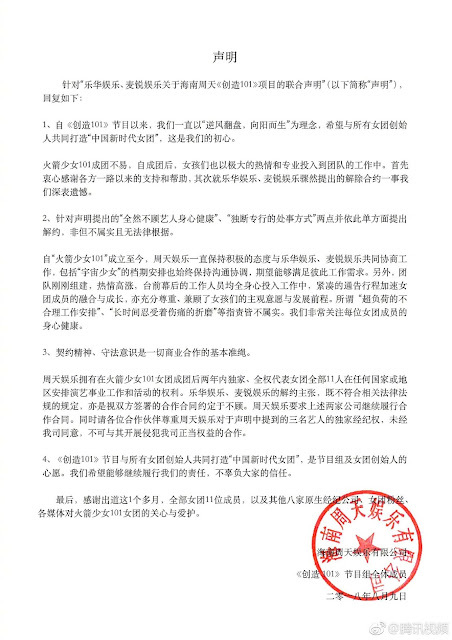 Within the same day, Zhou Tian Entertainment issued a formal response. According to Zhou Tian, the accusations that the girls had to endure health problems while coping with unreasonable schedules is false, and that Zhou Tian has been very concerned with the wellbeing of the ladies. Furthermore, Zhou Tian has rights to manage the eleven members of Rocket Girls and to represent them in any country for up to two years after the band's formation. Hence, they expect Yuehua and Maverick to uphold their end of the contract. It's really hard to say who's right or who's wrong as someone from the outside, but it seems clear that things are getting messy. The ladies are supposed to appear at Weibo Fan Festival on August 18, and it looks like the Rocket Girls will be appearing as eight. Well, Yuehua debuted 3 members of Nine Percent in NEX7, and the 3 boys later got very sick from overworked. The girls have also been seen having fun with their friends or going outing with their friends. So about the girls being 'overworked' while in Rocket Girls, while their boys are actually overworked while working in 3 groups? Yeah I don't buy it. IMO Yuehua is just being greedy because they actually want the girls to work with WJSN as well. So using being overworked as the main reason is just them trying to cover their own greediness.